There are a few contestants on Idol who have been living on borrowed time the last few weeks, and one of those contestants ran out of time tonight. You can probably guess who it is without reading further, but just pretend like you have no idea what I’m talking about. 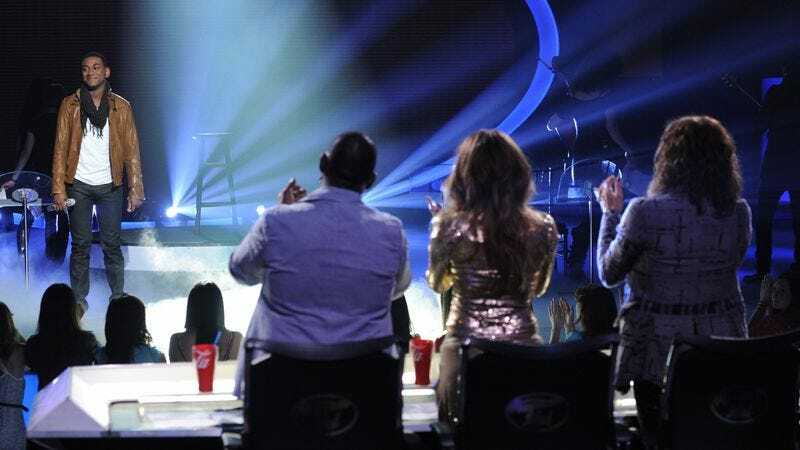 As the contestants dwindle, the producers need come up with more ways to fill time in the elimination episodes, so tonight we get three live performances. Surprisingly, it’s the least-known group that provides the most legitimately entertaining performance. The Queen Extravaganza, a tribute band blessed by Brian May and Roger Taylor themselves, perform “Somebody To Love.” They’re better than an Idol group medley: The lead singer actually vaguely resembles Freddie Mercury (in that “does that guy have more teeth than he’s supposed to?” way), and his guitarists perform flips and play behind their heads. It’s silly and fun, and in the end, they’re back by May and Taylor. Stefano seems to have relinquished some of his identity as a singer to try to embrace an Usher-esque dancer/man-about-town persona, but at least we know he could kind of sing. Katy Perry, on the other hand, would not make the top 10 on Idol. When Perry is poppy and addictive, I grudgingly admit she’s a ton of fun, but “Part Of Me” is not one of her more memorable songs, and her whole Army-chic thing is just rather tone-deaf and stupid-looking. I’m sure Jessica Sanchez’s dad loved it. Before we get to the results, the Idols are sent to the TMZ offices for some “media training,” a segment that seems quite toothless compared to last year, when James traded some pretty pointed barbs with one of the show’s/website's staffers. Hollie is messy, Jessica has embarrassing YouTube videos of her online, and that’s the extent of the “dirt” we get. Then we see a shot of producer Nigel Lythgoe in the offices, and it all makes sense. Jimmy is back tonight to provide commentary on the contestants, and he seems to be full of beans, not missing a chance to quip. The production of Jessica’s “Bohemian Rhapsody” was “less Queen than Stephen King.” Elise “doubled down on bad song choices.” If Joshua gets voted off tonight, “there’s something wrong with the entire ball of wax.” Jimmy agrees with me that it seemed inevitable that Phillip would be in trouble tonight, although I disagreed with him regarding Skylar’s second song choice. Why was Jessica’s “I love my military dad” song choice “clever,” but Skylar’s “I love my home town” song choice “indulgent”? I flopped last night when making my bottom three choices. Not surprisingly, Hollie and Elise are in there, but Skylar joins them as well. It’s hard to live in a world where more people liked Phillip’s performances than Skylar’s, but at least someday we’ll all be dead. Skylar’s immediately sent back to safety, and finally, we learn that Elise is out of time. It’s a bummer, because like Phillip (according to the judges), she’s actually one of the real artists on the show, but unlike Phillip, she’s not a semi-cute white guy. I’m a little surprised that she made it as far as she did, so while the show won’t be as interesting without her, it doesn’t feel like she’s leaving too early. Elise closes with a reprise of “Whole Lotta Love,” bidding adieu to the judges as she sings. It seems appropriate that the episode closes before we see the other contestants showering her with hugs and tears. Hollie… you’re next. Or next-ish. This season’s contestants are really not asked to do much for the Ford music videos compared to previous seasons. No zombie makeup or anything. Did anybody else see that girl who was in line to shake Ryan’s hand? He blew her off, and she made an awesome “Herp derp” expression. Casey Abrams looks like he not only doesn’t care what he looks like, but like he is actively fighting attractiveness.